In our next meeting at CES 2016, we swung by AMD‘s ballroom and had a chance to meet with Robert Hallack, the Head of Global Technical Marketing for AMD. In this meeting, he discussed a myriad of topics ranging from AMD’s new GPU architecture, named Polaris, to the new HDR technology. I know our readers are really wondering about Polaris so I will stay focused on that. 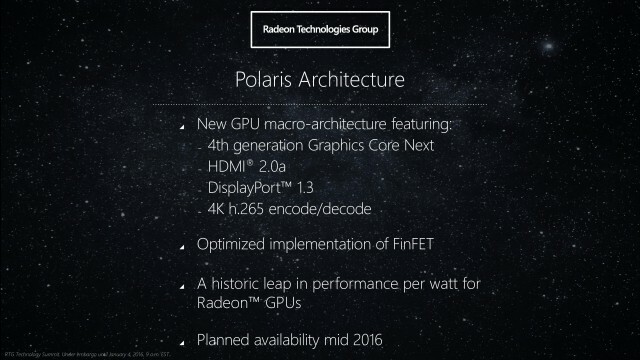 As some may know, Polaris GPUs will be built off the 14nm FinFet process. This die shrink and manufacturing process will have ~2x the performance per watt of previous generation. This is without final firmware and driver tweaks which will drive power consumption down even further. Hopefully that bodes well, and I expect it to, for the performance side of things moving forward. No details were given as far as expected power consumption, but it should be considerably less. See the slide below for more architectural details. We were not able to see the GPU itself, however we did see a side-by-side comparison with it playing Star Wars: Battlefront. The point of this side-by-side was to show the difference in power use between the two systems, the only difference between them being the GPU (a GTX 950 and a Polaris variant). What we do know: there is already a working sample cut and on the ballroom floor! It’s tough to compare in game as I didn’t verify FPS or any settings, however when in the same menu screen, the wattage difference observed was 149W vs 85W (which was inline with other slides from their presentation). Anandtech has a few more details as far as performance, in their article, they mention 1080p at medium settings with it hitting 60 FPS for the most part, with VSync enabled. So it seems it was close to apples to apples. Obviously Polaris-based GPUs are real, functional, and appear to sip on the power compared to the last generation GPUs. We see from the slide above that it will support the latest display output technologies with an eye on the future with high resolutions and faster refresh rates. Expect these to hit store shelves in mid-2016. This should turn out to be a pretty exciting year in the world of GPUs when these release. Where to start with this one? Remember CRT monitors? CRT monitors were great in a lot of things, one of those being true black and having good color reproduction and contrast. Fast forward to today’s LCD, and LED’s and while things have improved significantly in that area, things still are not as good as they were. 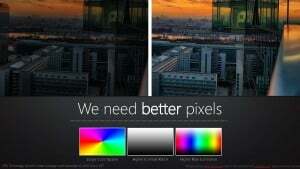 Bring in OLED’s whose ability to provide true black and reproduce colors more accurately, and we have a need to use new technology to bring the more lifelike images to the human eye. 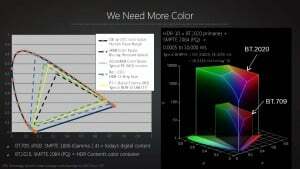 You may look at HDR and think that we have seen this before, and we have. However, its implementation just wasn’t, well, natural when compared to the demo that we saw at CES. The real goal of HDR is to bring your eye more luminescence and brightness in order to bring more lifelike images to the screen. Below are two slides from a recent AMD presentation on HDR detailing the need and improvements that could be had with emerging monitor technologies. Here is a detailed article from wcftech.com on this emerging AMD technology. Although we do not have any pictures that would do the comparison justice, just looking at a couple of the demos there, you can see an incredible difference. The image, due to how the HDR technology works, looks even more detailed due to the contrast and proper brightness (for this to work its best, AMD stated the TV should have the ability to produce at least 400 nit brightness). It almost looks like it uses a sharpen filter, but you are seeing things as the developer wanted. We also watched a couple of clips out of Life of Pi (still of scene here – not an image from the monitor). In the scene linked, the difference was incredible between the two. The contrast between the candles and water, as well as the people in the back holding candles, looked so much better and more detailed on the monitor that used the HDR, without a doubt. I am surely interested to see how this develops moving forward. Keep looking at the front page for more CES coverage!